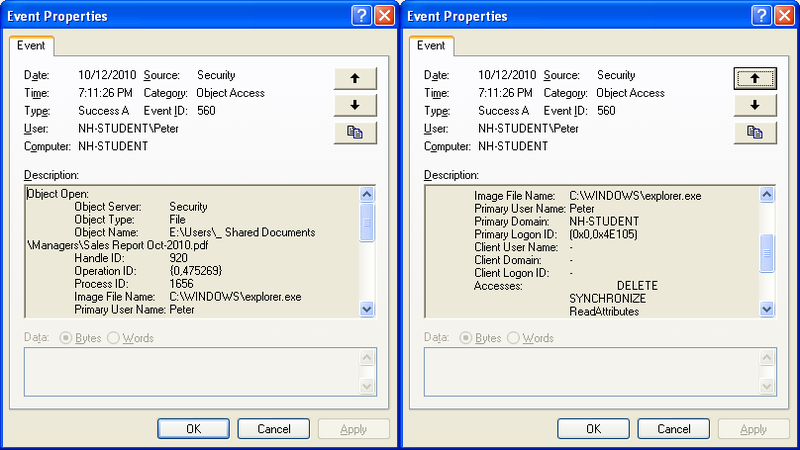 In Windows OSs, there is an Auditing subsystem built-in, that is capable of logging data about file and folder deletion, as well as user name and executable name that was used to perform an action. The Auditing is not enabled by default because any monitoring you use consumes some part of system resources, so tracking down too much events may cause a considerable system slowdown. Even more, since not all user activity is of interest for logging, Auditing policies enable us capturing only event types that we consider being important. policy configuration interface, thus making it too hard to configure. What configuration should be performed? 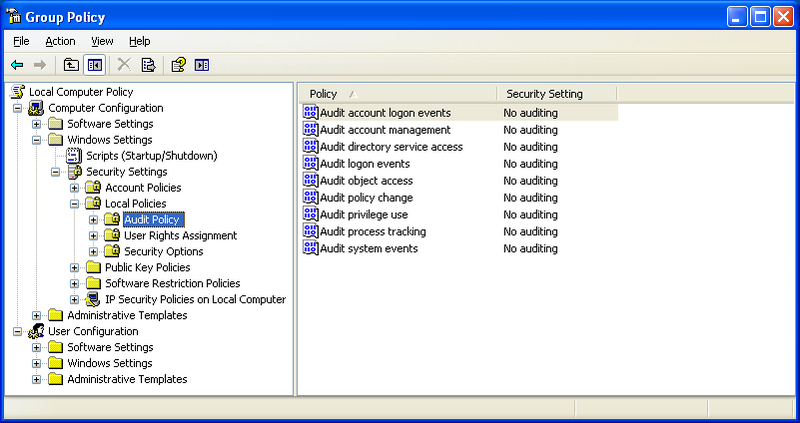 Double-click Audit object access policy and select Success checkbox. 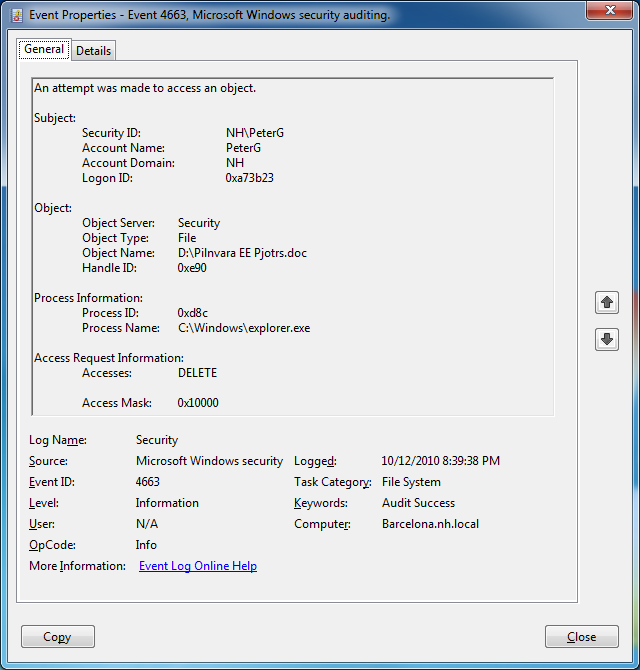 This policy enables file, folder and Windows Registry access attempts that were ended in a success. Actually, this is true, we are only interested in a successful file or folder deletion attempts. 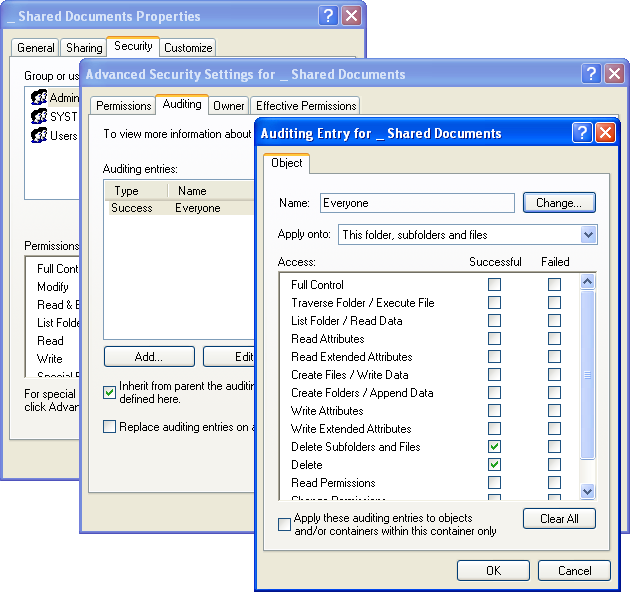 Only enable Auditing on computers that keep required documents on their local hard drives. Simply enabling policy option is not enough. It is also required to designate what folders exactly are to be watched. Usually, we require auditing shared documents and business application data folders (accounting, warehouse databases and so on) – i.e., resources accessible for editing by multiple users. Frankly, the log sizes recommended above are not calculated by any formula but are to be choosed depending on particular computer usage experience. Finally, how do we find out the person (Windows 2003/XP)? Accesses. A set of accessed privileges. The issue is that when performing certain procedures programs usually request multiple access types simultaneously — for example, Delete+Synchronize or Delete+Read_Control. The only important for us access type is Delete. Finally, how do we find out the person (Windows 2008/Vista)? Do not consider all the Deletes to be done on purpose. This action is frequently used as a part of normal business application standard functionality. For instance, during Save command execution Microsoft Office suite software first creates a new temporary file, saves document to it, then deletes the original document from disk. This is also true for many database applications: a temporary lock file (.lck) is created on disk and is being deleted from disk later when exiting the program. Очень ждем ваших постов по IPSec. Sorry, I’m not using IPSec in a real business environment at the moment. Thanks for this informative article ! 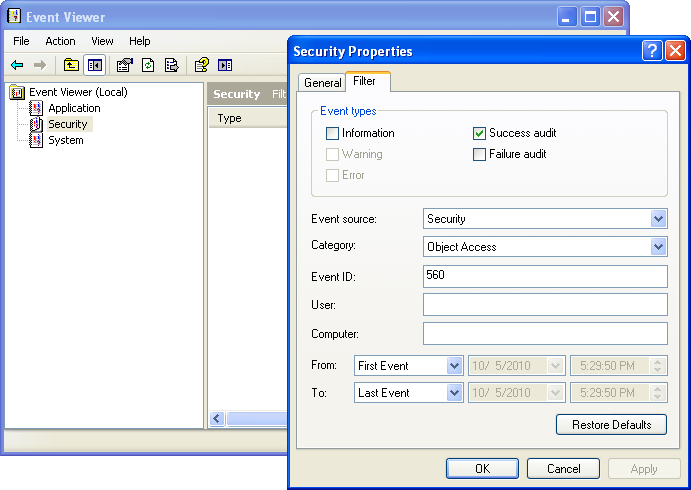 Though, To audit the activities of users in my working environment, I use an automated tool named Lepide active directory auditor i.e.,(http://www.lepide.com/active-directory-audit/) that monitor AD environment at granular level and provide the report with real time monitoring. However, this well described blog looks very helpful that shares the entire process in depth. Nice Information in brief. Thanks. Уведомление: Alguien sabe activar auditoria para campertas compartidas en windowsxp? Layer8 from Logfiller delivers this info and more direct from the UI so you can investigate the whole series of events from the Window Title.